GREY'S ANATOMY: "I Must Have Lost It On the Wind"
“I Must Have Lost It On The Wind” – With Cristina gone, a new doctor, Maggie Pierce (Kelly McCreary), making the rounds and Derek wanting to move to Washington DC, Meredith struggles to regain a sense of normalcy both at home and in the hospital. Meanwhile, Callie and Arizona come to a decision about surrogacy, Amelia overhears a big secret, Bailey realizes she will have to fight Alex for Cristina’s board seat and a freak accident causes two teenagers to be caught in a very compromising position, on the Season Eleven premiere of “Grey’s Anatomy,” THURSDAY, SEPTEMBER 25 (NEW TIME 8:00-9:00 p.m., ET) on the ABC Television Network. 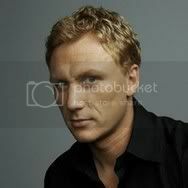 EPISODE DIRECTED BY KEVIN MCKIDD! !